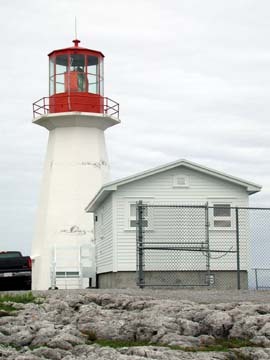 The Cape Norman Lighthouse was built by the Canadian Government in 1871. The original wooden tower was replaced by an iron one in 1907. That was replaced by the current concrete tower in 1964. The lighthouse is a few kilometres from the town of Cooks Harbour. There is a dirt access road (fairly rough when I visited in the summer of 2002). It is fenced, but the gate was open when I visited, allowing for close up views of the lantern room. The landform is rocky and makes interesting views from a distance. The area should make interesting walking and exploring if you have the time.